You want to surprise a dear person with something very special and give her a voucher? 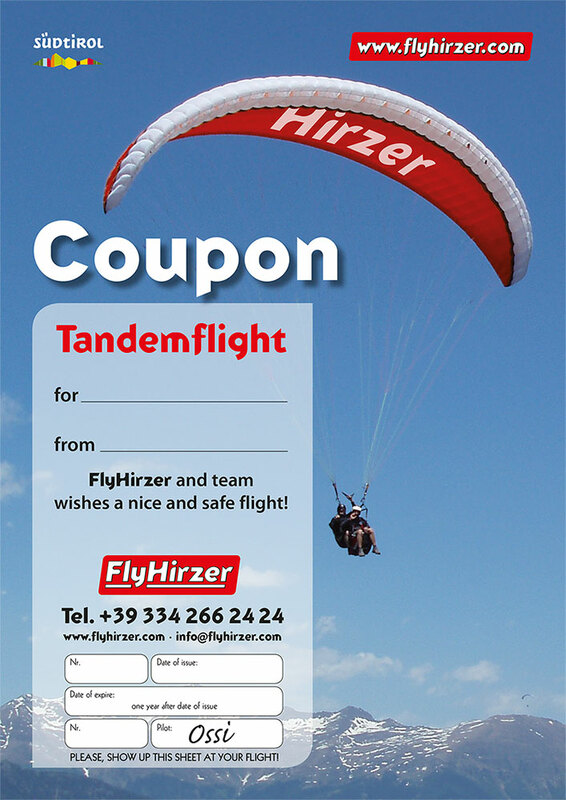 Maybe for a paragliding flight at the Hirzer or for a group tandem flight? That’s a good idea! Please fill out the following voucher form – we will send the voucher to the recipient. The voucher is valid after bank transfer and can be redeemed by the recipient for 1 year from the date of issue. The special experience! Fly like a bird over South Tyrol’s mountains. With one of our experienced flight instructors as a tandem pilot you will enjoy this indescribable feeling of a tandem flight. With just a few steps you lift off with us into another world. Relax and enjoy this special outdoor adventure. You soon receive our voucher by registered post. The voucher is valid for 1 year after date and can be redeemed anytime. The voucher is private and non transferable. Please transfer the amount provided for the selected route to the specified bank account. – IMPORTANT: by bank transfer insert the voucher number! – You will receive an e-mail as confirmation of your order and the voucher will be sent via e-mail or by post by registered mail (plus: EU and Italy Wide 6.05 euros). The voucher is valid after the bank transfer and can be redeemed for 1 year from date of issue by the recipient.